Irish Astrology, also referred to as Celtic Tree Astrology, is the astrological system practiced by the ancient Irish. It is based on a Druid symbol system and not on any of the traditional systems such as Western, Chinese or Vedic astrologies. The Celtic Zodiac is drawn from the beliefs of the Druids and is based on the cycles of the moon. The year is divided into 13 lunar months, with a tree (sacred to the druids) assigned to each month. Each tree has particular magical qualities whose secret mysteries come from the ancient shamanic alphabet, the Ogram. The origin of this Tree Alphabet is ascribed to the God of Poetry and Eloquence of Celtic Ireland, Ogam. He is also known as the Celtic Herkules. The Druids were Celtic priests who inhabited much of Western Europe, Britain and Ireland until they were supplanted by the Roman government and later, by the arrival of Christianity. Celtic Tree Astrology is the astrological system practised by the ancient Irish. It is based on an ancient Celtic symbol system. The Celtic Zodiac is drawn from the beliefs of the Druids and is based on the cyclesof the moon. The year is divided into 13 lunar months, with a tree (sacred to the druids) assigned to each month. Each tree has particular magical qualities whose secret mysteries come from the ancient Celtic alphabet, the Ogram.The Celts envisioned the entire Universe in the form of a tree, whose roots grew deep below (in the ground) and whose branches reached up high (into the Heavens). In time, the Celtic people eventually designated a tree to each of the 13 Moon Phase’s in their calendar, in accordance with its magical properties. As such the Celtic Zodiac is based upon the cycles of the Moon, with the year divided into the 13 lunar months established by the Druid religion. Celtic Astrology was created by the Druids sometime around 1000 BC. The Druid religion was based on 3 basic strands of belief: the first was to remember their ancestors and the past; the second was to have an understanding of nature so that they could work with it, not against it; and the third was to explore the connection of everyday reality with that of the spiritual realm.In Celtic astrology, the zodiac is based on the trees that the Druids held sacred. It was believed that the trees themselves expressed personal characteristics that could then be associated with particular months of the year. This was done by connecting the tree to a lunar month through the use of the consonants in the Celtic alphabet. 13 of the consonants form the calendar of seasonal magic, and the 5 vowels represent complementary seasonal stations.Unlike the Greco-Roman zodiac, the Celtic calendar has 13 astrological signs based on lunar months. Each month contains 28 days, except the last one (Ruis/Elder) which only has 24. However, the Celtic zodiac isn’t confined solely to the lunar cycle. The Druids split their years into 2 halves: the dark half and the light half to represent the recurring cycle of birth, life, death, and rebirth. As a result the Druids developed a zodiac rooted in both the lunar and solar cycles of life. Please click a Zodiac picture for more information about that sign from Celtic Radio.net! The Celtic ‘tree zodiac’ fabrications, the direct result of Robert Graves’ invention of a tree calendar’, have become an almost insurmountable barrier to any serious study of the forms of astrology that were practised by pre-Christian Celtic society. For fifty years, from the time Graves’ published his book The White Goddess (1946), a veritable industry has been built up among his acolytes, which preach artificial astrological ideas based on Graves’ spurious arguments. Some have even published books on what they fondly term ‘Celtic Astrology’, manufacturing a completely artificial ‘astrological system’. It has hitherto not been my practice to directly criticise Graves nor his acolytes. As a novelist and poet, Graves’ work is much to be admired and his two-volume study of The Greek Myths (1955) is highly regarded. There is even much in The White Goddess that is praiseworthy. It can be said that Graves’ work is a fascinating attempt at an anthropological and mythological study which, had he had some scholastic advice, might have resulted in an interesting contribution in the mould of Joseph Campbell’s work. In the ancient worlds, the study of astrology was as important as the study of astronomy. Magic and science were not separate disciplines, but part of the same coin. We know the Sumerians, Egyptians and Greeks of the western world all studied the movement of the heavens, along with Eastern and even ancient American scholars. It is upon the foundation of these western traditions that modern astrology is built. One culture that was renown for their knowledge of wisdom, including astrology, were the Celtic Tribes. The Celtic people eventually settled on the British Isles, but originally migrated westerly across Europe. The Druids, the priest caste of these people, held their lore in oral tradition, believing writing to profane sacred text. One must memorize all, including astrology. So unfortunately a complete system of Celtic astrology never survived in anything but a fragmentary form.The first piece of the puzzle was retrieved by Robert Graves, the famous author of the White Goddess. He correlated the thirteen letter Celtic tree alphabet, the Ogham, with a Celtic lunar calendar of thirteen months. 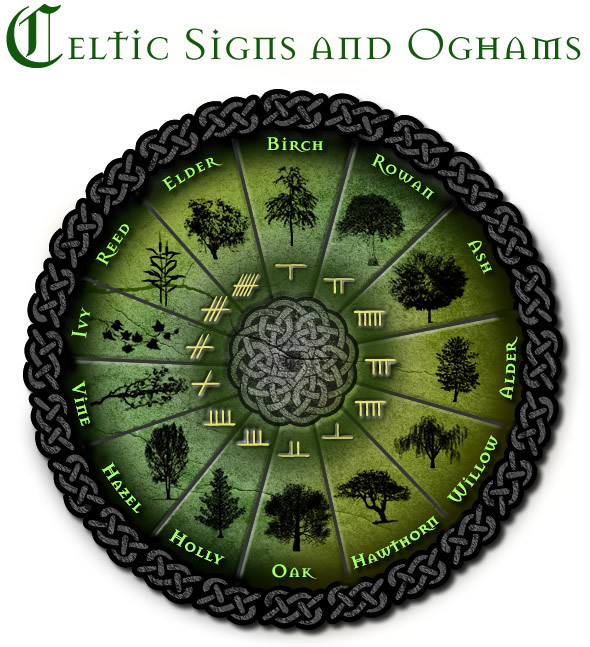 Ogham is a system of symbols, sounds and sign language used by druids. Each one represents a whole host of complex associations, based on the imagery of the sacred trees. Trees played an important function in Celtic myth and society. The word Druid comes from the word Duir, or oak, and is believed to mean “one who has knowledge of the oak.” If you had knowledge of the trees, you had wisdom and magic. Some modern critics have disagreed with Graves interpretation, while others have built upon it. One such author, Helena Paterson from England, gives us an excellent resource, with the The Handbook of Celtic Astrology and the Celtic Lunar Zodiac. Her system uses the Celtic information in conjunction with traditional western astrology, giving us an even broader view. Much like your traditional Sun sign can give you a lot of information, your tree sign can as well. Look to see what tree sign the Sun was in when you were born. Associated with the Sun, the Eagle, Stag and the bard Taliesin. Birch Tree people tend to shine like the Sun. They are very ambitious people. Work is taken very seriously and they are usually successful in business if they can find an area to excel in. Although stars with career, they tend to keep their private life private. As the family tree, Birch people also take family responsibilities very seriously and are often default heads of the household. Associated with Uranus, the dragon and the goddess Brigid. Rowan Tree people are futurists. Not necessarily in a technological way, but as visionaries for the future. They are humanitarians and take up worldly causes, but often in an unusual way. As the Rowan is said to magically break curses, Rowan people break control, authority and conformity. Although very kind and thoughtful, they can tactlessly express their controversial opinions. Associated with Neptune, the trident and Lir, the sea god. Ash Tree people have two currents running through them. One side is very artistic and sensitive, while the other is quite down to earth. Compassion is the key word here, as they see the best and worst the world has to offer. Because of this dual nature, their motives are often misunderstood by those round them. Associated with Vulcan, the chalice and the smith god Govannan. Those born under the Hawthorn Tree probably have a variety of talents aimed at communication. They are charismatic and well versed in many things, similar to the Celtic druids. They are great leaders and strategists, but at times their expressive nature is armed with the sword of anger. Verbal spars pepper their otherwise colorful life, as they experiment with life. Associated with Earth, the flaming spear and the mother goddess Danu. This is the tree sign of honor and regalness. People under the Holly Tree hold to their values, backed by a strong will. They are trustworthy and loyal. In short they have a great sense of character. Unfortunately this regalness can manifests as through pretentious or patronizing behavior. History past holds sway over this sign, and their homes are often filled with historical collections. Associated with Mercury, the rainbow fish and the god Ogma. Hazel Tree people are not only wonderful communicators, but gatherers of knowledge and wisdom. They have incredible memories and ways of relating information. Many express themselves in writing, scholarly pursuits or as administrators. Such people have an excess of nervous energy and can hold to their tension or manifest it as an argument. Overall, they are highly interesting and challenging people. Associated with Venus, the swan and Queen Guinevere. High emotions are a key aspect in the lives of Vine people. There is a restless quality in life. At times their gentleness and enthusiasm are on top. Other times they are excessively angry or sad. Even so, in the face of any opponent they are calm and collected, ever ready with a back up plan. They enjoy the finer things in life and like sharing with family in almost a motherly way. Associated with Saturn, the raven and the god Pryderi. The last of the signs, Elder people go through a transformation over life. At a young age, they are extravagant and energetic, but as they grow older, their grow into their power and earn respect. They can very self disciplined and overcome hardship that would break others, but can appear to be emotionless. The personal lives of the Elder tree people are very open and public. They like to travel the world for adventure, fame and fortune. Free Celtic Astrology Reading And Druid Horoscope Calculator. The Celtic Astrology Tree is also known as the Druid Astrology. This zodiac is based on a lunar calendar that comprises of 13 months and each month is characterized by a mystical tree. The Celts assigned each month to a tree and individuals born in that month were characterized by that particular tree. Each tree is also associated with the Ogham, the ancient Celtic alphabet.An ancient mystical runic alphabet ‘Ogham’ led to the development of the Celtic astrology. Unlike the Western or the Egyptian astrology the Celtic astrology, also known as the Druid Sign, comprises of 13 zodiac signs. The Druids were known to have been the inhabitants of the British Isles around 1000 B.C. who followed a lunar calendar consisting of 13 months.The Celts visualized the universe in the form of a tree and for that reason they designated a particular tree, based on its magical properties, to each of the Moon phases in their lunar calendar. Each Celtic Zodiac corresponds to a particular tree and it is believed that an individual’s personality is marked by the different influences of the tree of the sign.The thirteen astrology signs of Celtic Astrology are as follows: The Birch, The Rowan, The Ash, The Alder, The Willow, The Hawthorn, The Oak, The Holly, The Hazel, The Vine, The Ivy, The Reed and The Elder.A Celtic Astrology reading gives you a detailed interpretation of the sign you belong to in the Celtic zodiac, your lucky colors, lucky month, lucky letter, lucky flower, lucky gemstone, ruling animal, ruling deity, ruling planet, your polarity and your class and also some eminent personality born under the sign. 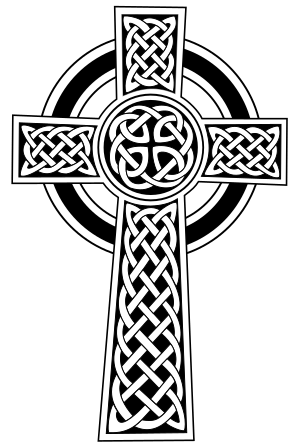 This Website also covers the area of Celtic Tree Astrology. There are pages on related material including a free monthly Horoscope. The nature of the Celtic Zodiac, the Trees involved and their meanings. Fascinating! Many Moons ago I gave a talk at the Irish Astrological Society, My interest in all things Celtic springs from my Irish ancestry and I was privileged to meet Olivia ( Fellowship of Isis) – Robert Graves Irish cousin. I also met this great modern day bard in London in the sixties! He will be remembered long after his critics return to dust – his resting place with laurels lies in the ancient building of Westminister Abbey – enough said! Helena Paterson – author of The Celtic Lunar Zodiac & Handbook. Thank you so much for your comment Helena! Time ‘got away from me’, hence the late reply.. Sounds amazing that you’ve met the people you mention, and would have loved to have attended the meeting to hear your lecture at the Astrological Society! I’ve since had the time to search for your book further, and I must say, will have to purchase that! So intriguing, along with your other books, so I thought I would also add the description and link to it on Goodreads..
“Discover your lunar self Solar-oriented astrology has dominated Western astrological thought for centuries, but lunar-based Celtic astrology provides the missing “Yin” principle. Explore the Celtic lunar zodiac, where each month is associated with a tree sacred to the Druids. Each tree-sign is broken down into its Celtic mythology and meaning”. You worked hard on this. I teach Caesar. So encouraging to get such lovely reviews comments on my books on Celtic Astrology. Now very busy writing a new book on Celtic Dragon & Tree magic based on the Celtic Lunar Zodiac – as a complementary study of the Qabalah Tree of Life and the Norse Tree of life – Yggdrasil. 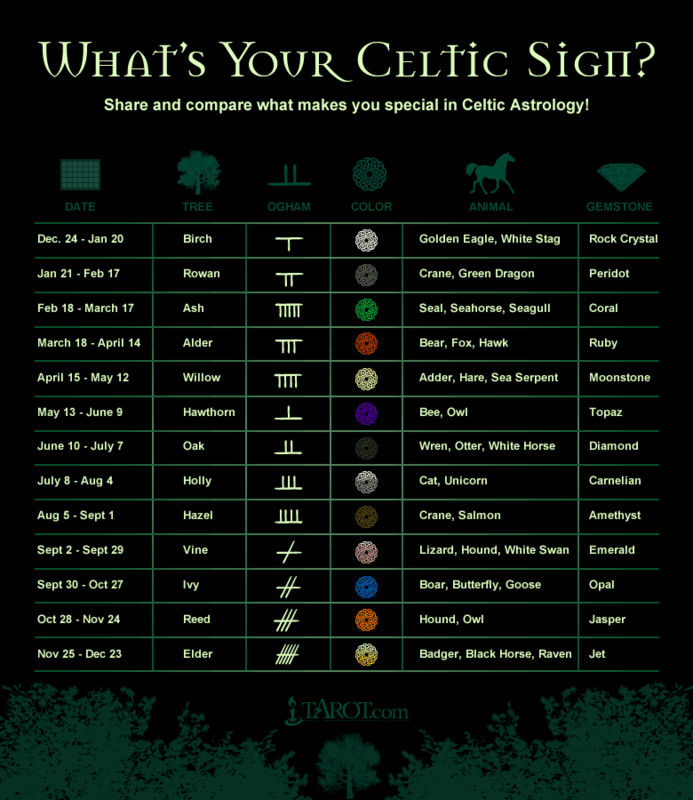 Sounds like I’ll have to design another page around the Celtic Lunar Zodiac and your book! Thank you so much for your kind comments. I would be delighted if you can post links for this book. I will make sure you get a signed copy.